(wipe that smile off your face)....that's the way it was put to me by Butch Coulter when I had just arrived. Butch is a great harp player who's been living in Europe for the last ten years or so but he did have a spell in Toronto and I don't think he found it to be a very welcoming musical scene. News flash! You have only to read my early blogs to see what I went through when I first came out to the blues jams. I remember seeing some great bands like Nigel Mack from the west, Glamour Puss from the East, Stephen Barry from Montreal - top-notch, award-winning bands, and yet no audience. Wecome to Toronto...where (if I may quote myself), "The Blues Is Hurting"
So in the last couple of days I've gone to three shows that just did not get the people out. There was The Mike Goudreau Band from Quebec - they played great and are quite popular down there but had virtually no profile here (the fact that they had just changed the band name didn't help, I'm sure). Then tonight from the west coast my label mates Doug Cox and Sam Hurrie at Hugh's Room and not a lot of folks out for that either. Doug also produces a festival out west so must get hit up continuously by artists who want to play his festival. The washroom at Hugh's Room was probaly not the place to be grovelling for a gig but I did ask if they were still accepting artist submissions - he said "next year". Oh well. This reminds me, there's a festival here in Ontario that invited me last year and I had to decline because I was touring in Quebec. I hope I've got a rain cheque on that one. After Hugh's, I swung by the show Downtown Jazz was producing - Charlie Hunter playing some phenomenal grooves with a decent crowd (but probably not a profit-making one). Charlie's got something special and he obviously had a fan base. I think if you asked how many people in that audience had Charlie Hunter records, it would probably be all of them. That was at the legendary El Mocambo. I loked the feel of the room. Before heading home, I dropped off the last of some jazz newsletters at the Montreal Bistro and there sitting at the bar was Canadian Jazz Legend Don Thompson. He was playing with Joanne Brackeen and Terry Clark...jazz royalty! And you know what? I didn't look like such a great house for them either...though it was probably fine earlier in the evening. At Hugh's I was sitting at a table with two busy promoters and was the one to bring it to their attention that they both have CD launches on the same night - both blues ingenues, too and believe it or not, a third young, female blues-based artists is releasing her CD on the same night at the Lula. Talk about fragmenting an already small market. It's a good thing these young gals have some appeal beyond the typical blues fan. Well, let's hope they've each got some devoted fans because you wouldn't want to leave it to the vagaries of the general public. To begin with, congratulations are in order for the JUNO nominations just announced last night. The Blues category nominees are Julian Fauth, Kenny “Blues Boss” Wayne, The Perpetrators, Paul Reddick and Harrison Kennedy. Paul and Harrison were on hand for the announcements (Julian wasn’t there – he probably had a gig). Harry Manx got a nomination in Roots & Traditional…allright Harry! (this is the paragraph where I might be tempted to whine about the fact that my CD wasn’t nominated even though I’m in rotation on JAZZ-FM, getting spins on CBC Radio and Galaxie, chosen as one of the best releases of 2005 by “Sunday Night Soul” AM1430 CHKT, Toronto (Johnny Max); “Rue D’Auteuil” CKRL-fm 89.1, Québec (Michel Dubois), Tim Holek‘s “Blues Bytes” and recommended listening by the Globe & Mail’s Brad Wheeler and Scott Yanow of allmusic.com…but I’m over that). A big thank-you to to all those folks for their support as well as Steve Fruitman, Ian Angus and Heather Fielding at CIUT-FM (3 months on the charts “Let The Good Times Roll”, 4 live appearances on “Acoustic Workshop” and "Back to the Sugar Camp") and David Barnard, Julie Hill and Steve Balla at CKLN-FM for many spins and on-air appearances. The Silver Dollar Room, 486 Spadina Ave.
And even if you don't know any festival producers, there's another way you could help: Last week as I was delivering newsletters, I decided to check if “Overqualified” had a “spot” at the HMV store on Yonge St. (I know I’m displayed at Sam’s – I’ve got friends and family working there!). And sure enough, at HMV there was a plastic divider with my name on it in the blues section. The bad news was that there was no CD (maybe that’s good news…). I immediately saw that someone had misfiled my CD under “Bland" (Bobby Blue, that is) so I corrected that situation but what I’m getting at is that even though it may cost a little more than buying it online or from me at a gig, purchasing “Overqualified For The Blues” at Sam’s or HMV will ensure that there will always be a little plastic divider with my name on it. A bit of immortality, eh? But we are not immortal, and I was reminded of that when I heard yesterday of the passing of someone whose name you probably never heard. I end this Blainletter with a nod to the lady who practically single-handedly got TD Bank as the title sponsor of jazz festivals across Canada (after du Maurier went away). Her name was Marilyn Mitchener, lest she be forgot. A lot of great music got played and heard thanks to her. 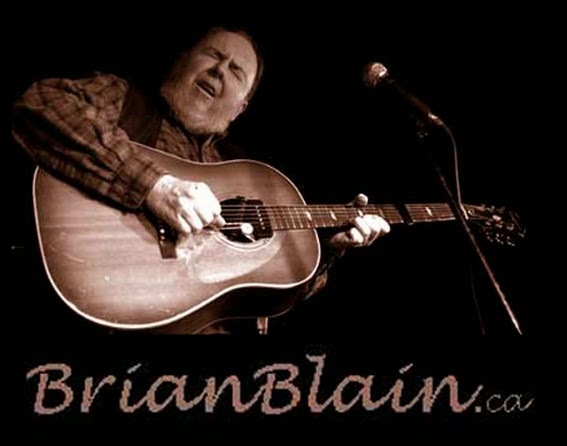 www.northernblues.com/bio_blain.html is where you can find a lengthy bio and lots of reviews.